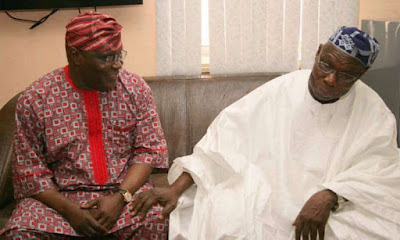 Atiku Abubakar, the presidential candidate of the main opposition party, PDP, has arrived the Abeokuta home of former President Olusegun Obasanjo. Atiku, who recently emerged PDP candidate, hopes to convince Baba Obasanjo to support him against Presiden Buhari. What are the conditions Obasanjo gave Atiku? He was the vice president when Obasanjo governed Nigeria between 199 and 2007. Both men, however, fell out due to certain issues which had dragged for long. On Thursday, the former vice president arrived Obasanjo's home at about 1:12 p.m. He was accompanied on the visit by the PDP National Chairman, Uche Secondus, and the director general of the Atiku campaign organisation, Gbenga Daniel. They then went into a closed-door meeting with Obasanjo. Baba is expected to give Atiku some conditions to guarantee good governance if he's supported by everyone to defeat President Buhari.